This is a a fun adventure game in which you will play a character called Murk. Choose your class and then head out into the big world. There you will have to complete missions to become bigger and gain more stats. Also you will earn more gold with which you can buy lots more stuff that will make you stronger. 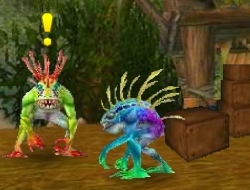 Help all the people in the village and make sure you will be the stronguest murloc they have ever seen, weather you will be a rogue, warrior, priest or sorcerer. Do your best not to die too often and make your way to the top and become clan leader one day. Use the WASD keys to move, Space and the mouse to interact with the other characters. Murloc 2 Stranglethorn Fever 0.00 between 0 and 10 based on 0 votes.